Small business lending among the largest U.S. financial institutions has weakened due to constraints from the Federal Reserve’s stress tests and capital surcharges for systemically important banks. BPI research finds that originations of small business loans from banks subject to the Comprehensive Capital Analysis and Review (CCAR) remained depressed after 2010 and are just about 65 percent of their level in 2006 while originations from banks not subject to the stress tests have recovered somewhat in the post-crisis period. 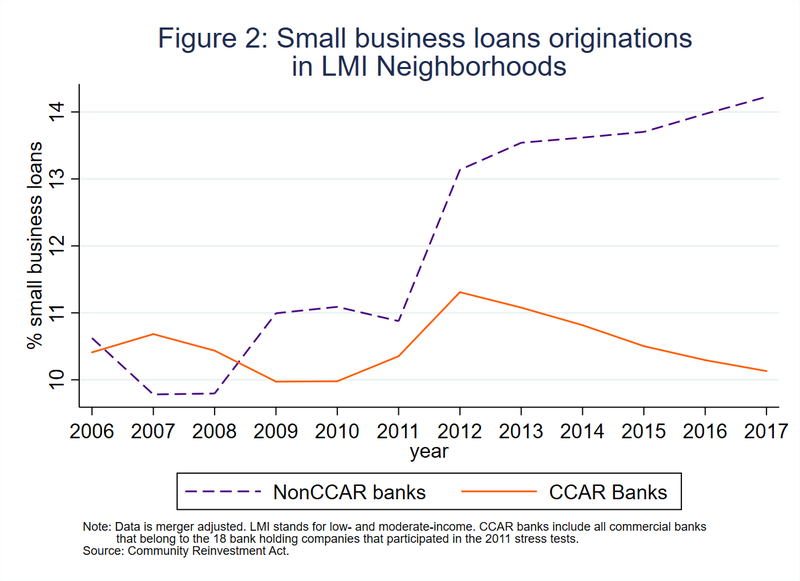 Furthermore, the share of small business loans made in low-and moderate-income (LMI) neighborhoods by CCAR banks has been steadily declining since 2012 while LMI small business loan share by banks not subject to CCAR has increased. Small businesses account for 66% of new jobs and the decline in credit availability to small businesses reduces the ability of the country to grow at its full potential and leads to wider wealth disparities across households. Moreover, tight access to bank loans also pushes borrowers in LMI communities to less stable sources of credit such as nonbanks. The Financial Stability Board (FSB) is conducting an evaluation of the effects of the G20 reforms implemented to date on the financing of small and medium-sized enterprises (SMEs). On December 12, the FSB’s evaluation team hosted a roundtable with industry representatives to discuss recent trends and main drivers of SME financing across FSB jurisdictions. Francisco Covas, Head of Research at BPI, discussed how post-crisis reforms, such as capital surcharges for global systemically important banks, the U.S. stress tests and Dodd-Frank Act compliance contribute to the weakness in small business loans on banks’ books. Covas also underscored the impact these reforms are having in credit availability to small businesses in LMI communities. Specifically, the share of loans made to small businesses located in low-and moderate-income neighborhoods by banks subject to the U.S. stress tests rose post-crisis but has been steadily declining after the start of the U.S. stress tests. The main takeaways of the discussion will be included in a report to be issued to the public ahead of the June 2019 G20 Summit. BPI’s presentation included data collected under the Community Reinvestment Act (CRA). The CRA was enacted in 1977 to encourage insured banks to meet the credit needs of the communities in which they operate, especially low- and moderate-income neighborhoods. The CRA data includes small business loan originations for commercial and industrial loans and loans secured by nonfarm nonresidential properties with commitment amounts less than $1 million and from banks with more than $1 billion in consolidated assets.1 For our analysis, we divided the commercial banks in the CRA data into two subsamples: (i) The eighteen banks subject to the CCAR in 2011; and (ii) the remaining commercial banks included in the CRA sample. For banks subject to CCAR we adjusted the sample to be able to construct consistent time-series. 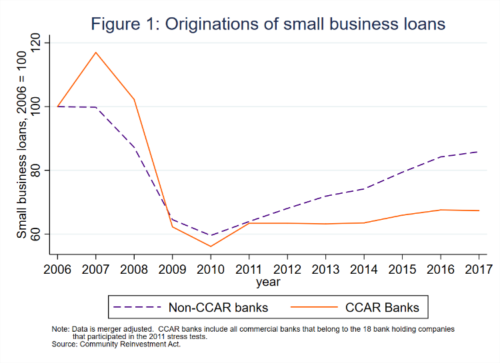 As shown in Figure 1, originations of small business loans from banks subject to CCAR (orange line) remained depressed after 2010 and are just about 65 percent of their level in 2006. In contrast, small business originations for banks not subject to the stress tests – the dashed purple line – have recovered somewhat in the post-crisis period and are more than 80 percent of their pre-crisis level. As noted by Chen, Hanson and Stein (2018), the very largest banks are an important driver of the depressed level of small business originations at CCAR banks, thus the capital surcharge for global systemic banks could also be an important explanation for this finding. Also, Chen et al (2018) show that the different behavior in small business originations cannot be explained by a shift in loan demand (e.g., if large banks were disproportionally located in communities hit the hardest by the Great Recession), because their analysis looks at small business originations by large and small banks operating in the same community, thus controlling for changes in loan demand. Figure 2 highlights small business loan originations loans in LMI neighborhoods. The CRA incentivizes banks to originate small business loans in LMI neighborhoods and the chart shows that approximately ¼ of small business loan originations are made in such neighborhoods. Although the share of small business loans made in LMI neighborhoods by CCAR banks initially recovered post-crisis, it has been steadily declining since 2012. 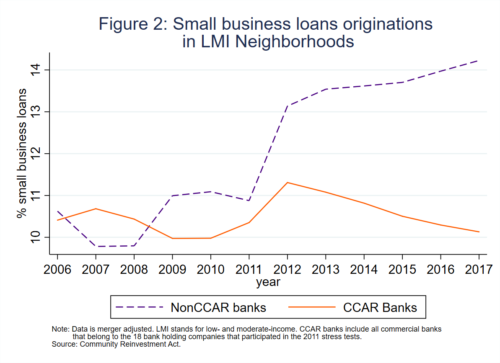 In contrast, the share of small business loan originations in LMI neighborhoods by banks not subject to CCAR have increased. The lack of credit availability to small businesses in LMI communities could have important implications for the widening of wealth inequality over the post-crisis period. A significant number of academic papers show post-crisis reforms have caused a reduction in the availability of credit to small businesses in the U.S. Acharya, Berger and Roman (2018) find that banks subject to the stress tests have reduced the supply of credit to borrowers with less than pristine credit scores or cyclical firms, including small businesses. 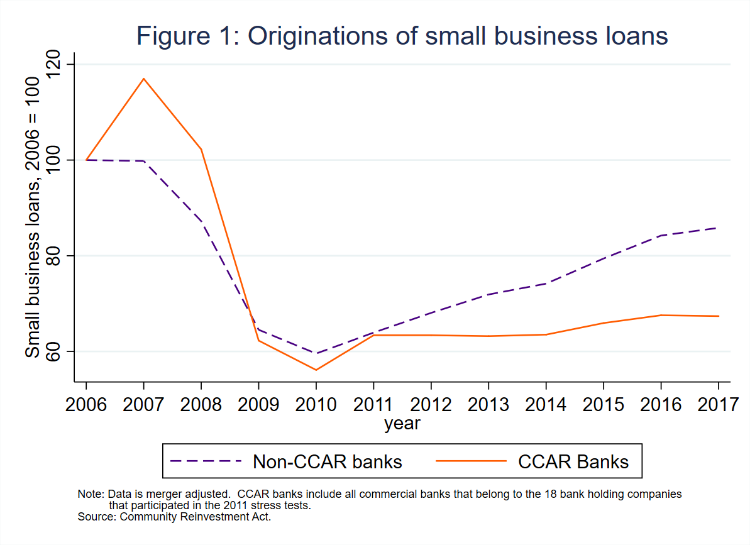 This finding is consistent with the results of Covas (2018), which by reverse-engineering the results of CCAR, finds that the risk weights for small business loans under CCAR are 3.2x higher than those under the Basel III standardized approach. Chen, Hanson and Stein (2018) demonstrate that the four largest banks cut back significantly on lending to small businesses in the post-crisis period relative to the rest of the banking sector. Importantly, they show that the reduction in small business lending led to a decline in the fraction of businesses that expand employment, slower employment growth, an increase in the unemployment rate, and slower wage growth in counties in which the largest banks had a significant presence. Cortés, Demyanyk, Li, Loutskina and Strahan (2018) argue that banks most affected by the stress tests reduced their supply of business loans by increasing loan rates and shifting their portfolios towards safer loans. Lastly, Bordo, Cole and Duca (2018) find that an increase in regulatory compliance requirements brought by the Dodd-Frank Act reduced the incentives for banks of all sizes to originate small business loans. The FSB roundtable also spent a significant amount of time discussing alternatives sources of financing to small businesses. Data availability on small business lending by nonbanks is scarce, but the results of the paper by Chen, Hanson and Stein (2018) use PayNet’s proprietary data that includes loan originations by banks and nonbanks. Thus, the results in the paper show that there has been a contraction of aggregate supply of credit to small businesses, even considering the nonregulated sector such as online and payday lenders. There was also some discussion on the impact of G20 reforms on incentivizing nonbank financing to small business lending and if that would weaken financial stability and amplify the impact of the next crisis as cyclical lending activities move to shadow banks. During the roundtable, several industry representatives from the EU noted that SME trends in their jurisdictions looked healthy, except for some peripheral European countries which still have elevated levels of nonperforming loans because of a longer recession. However, several participants expressed concerns regarding the procyclicality of the new accounting standard – also known as IFRS 9 – on SME financing. Given the cyclical nature of SME lending, banks are concerned that loan allowances will be very volatile and extremely sensitive to relatively small changes in macroeconomic conditions. Such volatility will discourage banks from extending SME loans, particularly during economic downturns. Overall, a key takeaway from the FSB roundtable is that in order to understand the impact of post-crisis reforms on small business lending, it is important to recognize diversity across FSB jurisdictions. Among advanced economies, the United States exhibits the most depressed trends in bank lending to small businesses likely in response to the adoption of more stringent prudential standards relative to those agreed internationally. In contrast, the EU followed the introduction of more stringent capital standards under Basel III by reducing capital requirements for SME loans via the so-called SME supporting factor. Another important takeaway is that the impact of post-crisis reforms on small business lending needs to be assessed through the lenses of the cost and benefits of higher capital requirements. However, several panelists pointed out that assessing the costs and benefits of higher capital requirements is an extremely difficult task, particularly when the costs could be significantly underestimated if the tight credit availability to small businesses turns out to be an important driver of the slowdown in productivity growth over the past decade. CRA data overstates small business loan originations because it assumes the credit line of a credit card loan is fully drawn when the credit card is approved or renewed. A LMI neighborhood is defined as a census tract in which total income is less or equal than 80 percent of the median family income. Between 2011 and 2012, there was a significant change in the census-tract geographic designations and therefore in the number of tracts that are classified LMI.